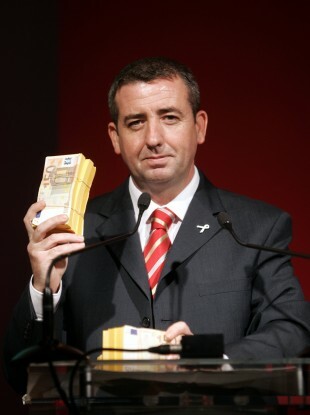 Ciarán Lynch holding bundles of cash during a controversy over a pay rise for former taoiseach Bertie Ahern in 2007. THE LONG-AWAITED banking inquiry looks set to get under way as early as next month with the focus now on what TDs and Senators are likely to be involved. The special Oireachtas committee will have nine members and be headed by the Labour TD and finance committee chairman Ciarán Lynch with three other government TDs, one deputy each from Fianna Fáil, Sinn Féin and the Technical Group, and two senators – one government and one opposition. Lynch was the toast of Leinster House yesterday, being congratulated by colleagues everywhere he went. But who is likely to be joining him in carrying out the first public and political investigation into the events leading up to the €64 billion bank guarantee? Various factors will play into the eventual selection including previous experience. Those who sit on the Public Accounts Committee, Finance Committee, or both, have a strong shout. Government chief whip Paul Kehoe stressed yesterday that opposition party whips should consider carefully who they nominate given the issue of bias – subjective commentary about bankers and the banking collapse – might rule out a particular TD or Senator. The committee which will ultimately sign off on the inquiry membership, the Committee on Procedures and Privileges (CPP), can, if it receives a complaint, disqualify a TD or Senator from sitting on the inquiry. In reality this means that the government’s control of the CPP (it has the majority of members) means it will be the ultimate adjudicator. With Labour getting the chairmanship, Fine Gael will almost certainly have at least two TDs on the committee itself. Names understood to be under consideration include Kieran O’Donnell (below), an accountant who is described as “a very good questioner” by one government source and a clear frontrunner. Another in the frame is Cork North Central deputy and former national Economic & Social Council member, Dara Murphy. He has frequently represented the party on broadcast media in recent months and is considered to have performed well. Wexford TD and finance committee vice-chair Liam Twomey is also being talked about as is Cavan-Monaghan deputy and former bank and Credit Union worker Heather Humphreys. A number of the party’s younger members including PAC member Eoghan Murphy and trained barrister John Paul Phelan are understood to be interested. Their names haven’t been ruled out by government sources. Simon Harris, who straddles both PAC and the Finance Committee, is also in contention but he is currently running for the European Parliament and it is thought if he doesn’t get elected he could get a junior ministry in the reshuffle. For Labour, they are likely to get at least one other TD, in addition to Lynch, on the inquiry. Those being talked about are Kevin Humphreys, a strong favourite, and former bank worker Arthur Spring, both of whom sit on the Finance Committee. Gerald Nash, a member of the PAC, could also be in contention as could Aodhán O Ríordáin who has declared his interest. Fianna Fáil has already nominated Michael McGrath (below) to be its representative on the committee and his nomination is unlikely to cause issues for the government. Sinn Féin’s choice is trickier. Pearse Doherty will likely be the party’s nominee but his previous comments in relation to the financial crisis and bankers are causing unease among those involved in setting up the inquiry. There is no obvious alternative that the party can put forward and of all the issues surrounding the inquiry a dispute between government and Sinn Féin over this particular matter will be one to watch. Similarly there is no obvious Technical Group nominee. The outspoken Shane Ross (below) has already ruled himself out admitting it would be wrong for him to even apply given he has written a book about bankers in which he was harshly critical of them. Wicklow TD Stephen Donnelly could also be in the running but previous comments he has made could also cause problems. The same could also apply in the case of People Before Profit’s Richard Boyd-Barrett who it is thought to be interested. There has not been a huge expression of interest from Technical Group TDs ahead of a meeting about the matter next Tuesday. One source pointed out that the work involved – up to three days a week for many months – could be a deterrent given TDs’ other commitments. Finally, in the Seanad a decision on whether the government nominee will be Fine Gael or Labour will need to be made. For the bigger party, Senator Colm Burke, is a name being discussed while for Labour, its leader in the upper house, Ivana Bacik, could be in contention. Of the opposition senators, Seán Barrett, an independent and senior lecturer in economics at Trinity (not the Ceann Comhairle), is the most likely pick. The actual make-up of the inquiry should be clear by the end of next week. Once the motion is approved in the Dáil on Tuesday, it goes to the Seanad with the expectation that the inquiry will begin its initial work in early June. Email “Here are the TDs and Senators who are likely to sit on the banking inquiry”. Feedback on “Here are the TDs and Senators who are likely to sit on the banking inquiry”.